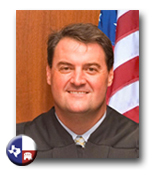 Justice Jeff Rose serves Texas' Third Court of Appeals and is running for re-election. Justice Rose brings a wealth of experience and accomplishment to the Third Court of Appeals. Rose's public service has included work as a State District Judge for Travis County, Chief of General Litigation for the State of Texas, and Deputy First Assistant Attorney General under Texas Attorney General Greg Abbott. In private practice, Justice Rose represented a broad cross section of clients in litigation matters and earned partnership in a large Texas law firm. His service to the community, the public, his clients, and his fellow lawyers gives him the foundation to be a strong voice on the Court. Justice Rose has earned Board Certification in Civil Trial Law and has been recognized four times as a "Texas Super Lawyer." He has been active in the Austin Bar Association as a Director and through the community service and continuing legal education committees. Rose has also given back to the Austin community, and in particular to children in need, through his leadership roles in Big Brothers/Big Sisters, The Rise School of Austin, and The Sportsman's Club of Austin. "I am honored to serve on your Third Court of Appeals. My experience as Deputy Attorney General under Greg Abbott, as State District Judge in Travis County, and as a Board Certified attorney prepare me well to serve you on the court. Please vote and help me continue to serve!"